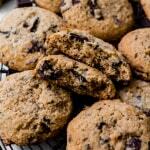 Paleo or not, this is one of the best chocolate chip cookie recipes you'll ever try. It's so good that you can plan to share it with your friends, whether or not they eat grains! Best right out of the oven, these cookies have the requisite crispy edges and soft centers and are studded with flecks and pools of rich dark chocolate. Preheat the oven to 350°F. Line a baking sheet with a silicone pad or parchment paper, and set aside. In a large mixing bowl, whisk together the almond flour, coconut sugar, coconut flour, baking soda and salt. Set aside. In a smaller bowl, whisk the egg, then whisk in the oil, maple syrup, and vanilla. Pour the wet (egg, etc.) mixture into the dry (flour, etc.) mixture and stir to combine. Fold in chocolate until well distributed. Let the dough rest 5-10 minutes. It will firm up. Use a medium cookie scoop (about 2 Tablespoons) to create 14 dough balls. Place them, evenly spaced, on the prepared cookie sheet. Optional: sprinkle a little coarse salt on top of each cookie. Bake for 13-16 minutes, until golden brown and crisp around the edges. Remove from oven and allow the cookies to cool for 10-15 minutes on the baking sheet before transferring to a wire rack to cool completely. Make sure you use a cookie scoop, if possible, to portion your cookie dough evenly. Similar-sized cookies produce uniformly crispy edges. Cookies of all different sizes won't cook at the same rate so some of them might be burned while the others are just crisping up. Don't forget to line your baking sheet with a silicone mat or parchment paper, to prevent the bottom of the cookies from sticking or burning. Do not try to transfer your cookies off of the baking sheet right out of the oven. They will be too soft and will fall apart. Let them cool and firm up on the baking sheet, as the recipe requires, even though it is torture! The crispy edges don't last forever. These cookies are best within a few hours of baking; once you store them in an airtight container overnight, the moisture redistributes and produces a softer, cake-ier cookie. To compensate, add a few minutes of bake time or store them in the fridge after the first day. After about the 5th day, transfer them to the freezer.